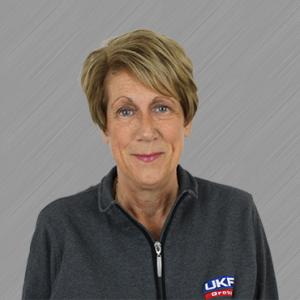 Founder and sole owner of UKF Stainless Limited and the UKF Group. Over 30 years’ experience in the stainless steel industry including 6 years in a tube making company. Stainless steel is my passion most especially welded stainless steel tube. My son Chris and daughter Jess now work within the business and it is a huge pleasure to work alongside them and to see them flourish. Outside of the company I enjoy family life, travelling and gardening also the odd beer with friends and a bit of exercise when I can muster the enthusiasm. My role as Group Managing Director covers all areas within the business, and no 2 days are ever the same. 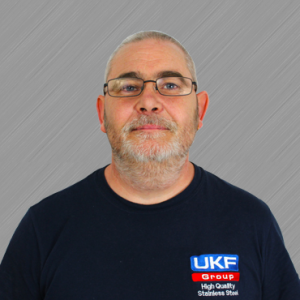 My career began in a tool room, too many years ago to mention, from there I progressed into Quality Management, the role in which I started UKF in during 2001. From there I have progressed to my current role. Outside of UKF I volunteer as Chairman of a local Swimming Club, where some of the skills learnt in a work environment are transferrable to this role, my satisfaction from this is to see the children grow their confidence and social skills and to develop their swimming abilities. As the Operations Director my role and responsibilities are to look after all aspects from the operations side of the business along with looking after some key accounts. I have been with the company since 2008 within that period I have worked through the warehouse, goods inward/stock controlling, production scheduling, Site/General Manager. This has enabled me to build many relationships with all members of staff, customers and suppliers. When not in the office I enjoy boxing at amateur level and currently hold the “Midlands Amateur Middleweight Belt”. Having joined JPC in 2013, it is my responsibility to ensure that our customer interface is of the highest quality, providing quick, accurate and competitive responses to RFQ’s, conducting feasibility in conjunction with the operational team, and generally ensuring that we exceed our customers’ expectations. Previously, I have been involved at all levels within the global steel industry, and am proud to have held several senior management positions in multi-national steel service centre businesses during the last 20 years. My leisure time has been full and rewarding, with many sporting achievements including county and national level swimming, martial arts at a competitive level as well as basketball and football at club level. In more recent times, I am more than content to just play an occasional game of veterans rugby as well as watching my son play club and county rugby. I have worked for UKF Stainless for the last ten years. Previous to that I worked for Coventry Tubes, Matthey and before that I worked for Welded Stainless Steel / Stay Strip. Over the many years working in the tube trade which included an apprenticeship with Swiss Engineers and enabling me to achieve qualifications in engineering. During my career I have achieved management level with all the companies I have worked for. Now working at UKF I use these skills to help move the company forward in the engineering side of the business. 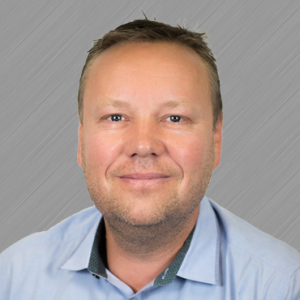 After working for 35 years as an executive financial professional in the construction, wholesale and travel sectors, I have joined the UKF Group as the Group Finance Director to maximise business performance, develop margin and budgetary controls, and provide advice on key management information. By achieving this, I hope to build and develop a financial infrastructure and management platform for the UKF Group, that can help the company to achieve more. My weekends are usually taken up with trips to theme parks or National Trust sites with my family. I also have a keen interest in bonsai tree cultivation & spiritual and mindfulness practice. 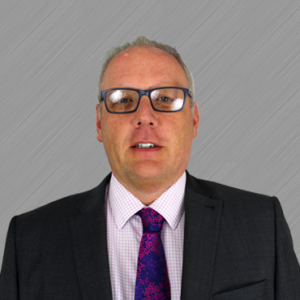 With over 20 years combined experience in sales and customer service both inside and outside the steel industry, my role at UKF Group is to maintain and develop existing customer relationships, and to help grow the business further. Outside of work, you’ll find me spending quality time with family (especially my daughter) and friends, in the gym, listening to music, watching movies and boxsets. My passion is food and drink incorporating this with football and cricket. Working in the Nickel Alloy industry for 25 years plus, then a short move into Copper Alloys world, which lead me into the challenge that is stainless steel, joining the family-owned company, the UKF Group. 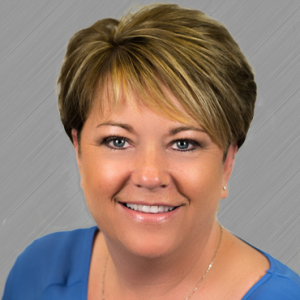 I hope to bring my vast years of experience to build and increase confidence with both new and old customers. I enjoy swimming 2/3 times a week (look out the Olympic team) and spend precious time taking my granddaughter horse riding at weekends. 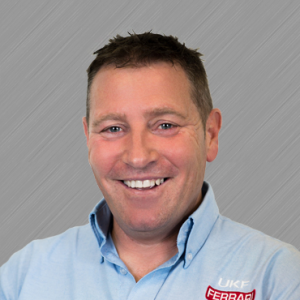 My job is to offer a high standard of service to new and existing customers to help further develop the business we do with them. I have worked in Technical sales over the last 6 years where my time has been spent in companies ranging from smaller family run businesses to multinational, Global Organisations; where I have gained knowledge on a range of products (Mild Steel, Stainless Steel and Aluminium both Section and Plate) and services to include but not limited to, flat bed and tube laser cutting, water jet cutting, plasma cutting, drilling and saw cutting, manipulation. You can usually catch me in my spare time partaking in Track Days, driving high performance cars in attempt to set a few records. Last one was achieved in a Nissan GTR. I also own an Ex-Racing Thoroughbred horse, whom I have taken a lot of time, dedication and TLC to get county-level ready for 2019. My role at the UKF Group’s Southern Office covers all aspects of the business which makes for a varied working life. 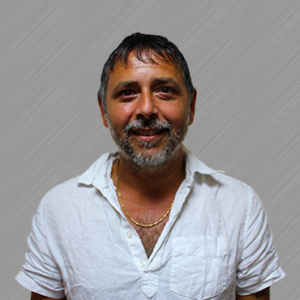 In my 25 years selling metals I have acquired a broad knowledge of the products and the people in the industry. My free time is mostly taken up with my son’s various sporting activities and spending time with my family. 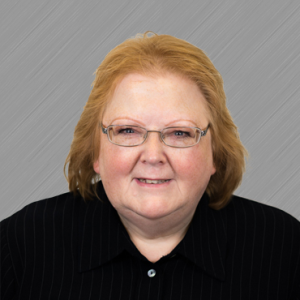 I began my role in Sales working for a large metal stockholder and over the past 6+ years have gained extensive product knowledge and built up strong customer relationships. 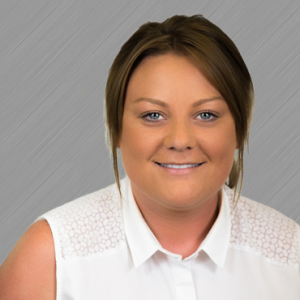 I was appointed Sales Executive at Ferrari Stainless and Alloys in January 2014 and having just taken a year’s maternity leave I am back working part time. I thoroughly enjoy my role, and love working with such a great team of people. Responsible for the Purchasing of all our stainless steel products that we distribute, the logistics relating to our stock holding division as well a prominent role in the sourcing of many other stainless steel materials for our sister companies The Joint Perforating Company, Ferrari Stainless & Alloys & Stainless Metals & Alloys. I have been with the company since 2002, which gives me a highly valuable experience within the stainless steel industry and markets. It is my responsibility to ensure stock of the highest quality at the most competitive price is consistently available to service our diverse customer base. It is my aim to provide a world class service in this area to both my external customers and internal colleagues alike. My hobbies outside of the working environment consist of running, motorcycling, rock & roll, fashion and music. 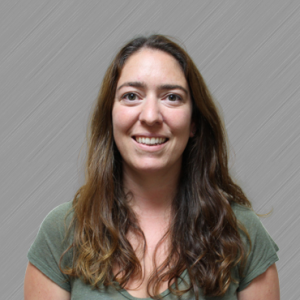 I started my role as Sales Administrator in January 2008, before that, I have worked as an Office Manager at a local soft drinks Company, and previous to that as a Supervisor in an IT Company. Outside of work, I enjoy time spent with my family and especially my new Grandson. I started working for the company back in 2012 initially on reception with some administration duties also within this role. Over time I started to support the directors and more recently I have moved in the main office and am now supporting the sales department as well. I thoroughly enjoy my role and quite often no two days are the same. Outside of work I enjoy travelling, relaxing & socialising. 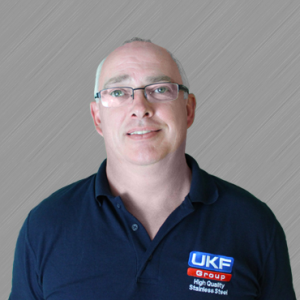 Having joined the company recently and with some 35+ years of experience served within various automotive quality management environments, my responsibility is to promote, maintain and continually improve upon all aspects of the Quality Management Systems within all divisions of the UKF Stainless Ltd Group. Outside of work I enjoy travel, DIY and socialising. 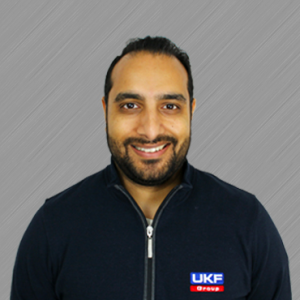 I joined the UKF Group in 2009 as a Saw Operator Setter and eventually became a Group Quality Engineer, where I am responsible for auditing, quality control and calibrating the machines on-site. My normal work day involves liaising with individuals on all levels of the company from the guys and girls on the shop floor to the Chairman and Managing Director. My duties also include answering any quality enquiries our customers may have to ensure we provide the perfect service. Outside of work, I enjoy spending my time with my family and my close group of friends. 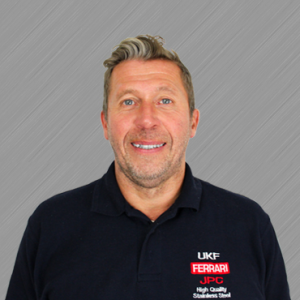 I joined the UKF Group in Feb 2014 with over 25 years experience in Quality Engineering, primarily within the Automotive sector. I am now based chiefly at the company’s JPC site where I provide support to the Manufacturing function and our wide customer base. In my spare time I enjoy singing in an acoustic covers band and travelling the world. 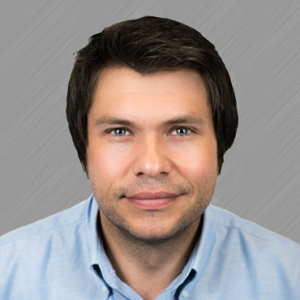 My roles include desktop support, network management, server maintenance and overseeing all the technical aspects within the company. I joined the company in 2010 as a Sales Administrator, progressing my way through my current role as the IT Manager. Outside of the office, you’ll find me travelling the world, sleeping or working on the farm (in the warm weather!). As Group Graphic Designer, I work within the marketing department. It is my responsibility to create graphics to be used across both print and web. Before working at the UKF Group, I studied Digital Media at the University of Portsmouth and graduated with a First-class honours. In my spare time I have a season ticket at Aston Villa, I also enjoy running and going to the gym. 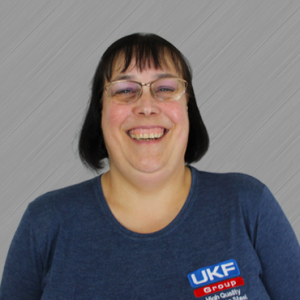 My role with UKF Stainless Group covers all areas of finance and payroll, it also includes managing the company’s debtors, creditors and monitoring cash flow. I started to work for the company back in 2000 and have certainly seen a great deal of growth and changes in that time. In my spare time I enjoy travelling. 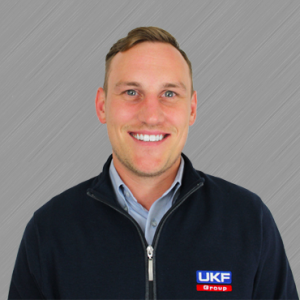 After working as a Commercial Manager for a Sheet Metal Fabrication company, I joined the UKF Group to get me back into the factory environment and closer to the people working on the shop floor. As Site Manager, it is my responsibility to supervise the production line, the Health & Safety aspects, and the delivery of goods. On a normal day I will be found on the shop floor checking the capacity of our machinery, assigning staff to tasks that best pleases their skill sets, and making sure production is kept on schedule. I enjoy playing strategy and sport video games, keeping fit through Crossfit, climbing and walking my three dogs. I am also a proud owner of a rabbit, chinchilla, two guinea pigs, two snakes and the latest addition, a Queen Ant that I hope to raise a colony of thousands from. The exercise and gaming keep me active both physically and mentally, while teaching me there is always more than one strategy to meet your goal. With over 35 years in Quality and Engineering, I play a crucial role in the continual improvement of the Group’s processing procedures through the introduction of leaner production systems that will utilise tool design to provide better and more efficient results. My day-to-day tasks involve looking after some of the Group’s critical accounts through consultations and order management. 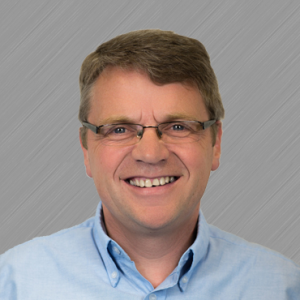 As the Senior Manufacturing Engineer, I am responsible for the ongoing improvements in our manufacturing capabilities, to match the growing demands the Group faces. In my spare time, I am usually spending the day on a golf course. 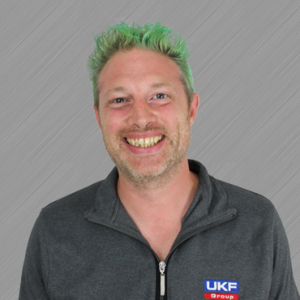 As the UKF Group’s lead CAD/CAM Programmer, I work closely with the Sales Team and the Laser Technicians on the shop floor. My day-to-day tasks are to create and raise work orders, digitally draw parts using the CAD software, Artube as well as reviewing customers’ designs and discussing any potential improvements possible on the design before sending it to be executed. I am a proud father and a Season Ticket Holder at The Hawthorns. When I’m not spending time with my family or watching West Brom at home, I’m most likely on the XBOX or watching football. 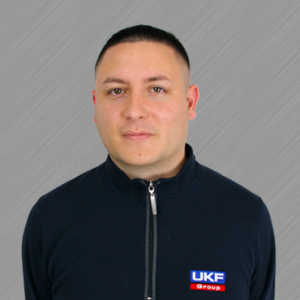 Since joining the UKF Group in 2010 as a driver, I have worked my way up to my current role. My responsibilities now encompass all logistical operations across the Group and regularly visit each of our United Kingdom and Ireland sites. As a Saints fan, I do my best to regularly attend their matches and have a passion for travelling. Having worked in the Southern Office for over 30 years, I can confidently say I have loved every second of my time here. My day-to-day tasks involve managing the stock and processing the material ready for delivery. With such an abundance of natural beauty in Dorset, I spend most of my free time walking the country trails as I try my hand at a bit of photography. As a qualified First Aider and Warehouse Assistant, I’m responsible for making sure the warehouse is running efficiently and safely. From helping the team process material, and loading and unloading the lorries, I make sure only the best material is used for each job. When I’m away from the warehouse, I balance my time between spending it with my family and friends, and working on my cars.